Is the Universe Perfect for Life? Doesn’t it feel like the Universe is perfectly tuned for life? Actually, it’s a horrible hostile place, delivering the bare minimum for human survival. Consider that incomprehensible series of events that brought you to this moment. In a way that we still don’t understand, a complex mix of chemicals came together in just the right combination to kick off the evolution of life. Generation after generation of bacteria, insects, fish, lizards, mammals and eventually humans somehow successfully found a buddy and passed along their genetic material to another generation. Clever humans invented computers, the internet, YouTube, and somehow you found your way to this exact video, to hear these words. Whoa. It’s amazing to consider the Universe we live in, and how it’s perfectly tuned for life. If just a single variable was a little bit different, life as we know it probably wouldn’t exist. Gravity might be a repulsive force. Pokemons might catch you. Doesn’t it feel like the Universe was created especially for us? I mean, didn’t I already tell you that we’re all the center of the Universe? I’m sad to say, but this couldn’t be further from the truth. The reality is that the Universe is 100% completely inhospitable. Well, apart from a thin layer on the surface of our Earth, but that’s got to be a rounding error. A fraction of a fraction of a fraction of the teeniest percent of the volume of the Universe. The rest of the Universe is bunk. 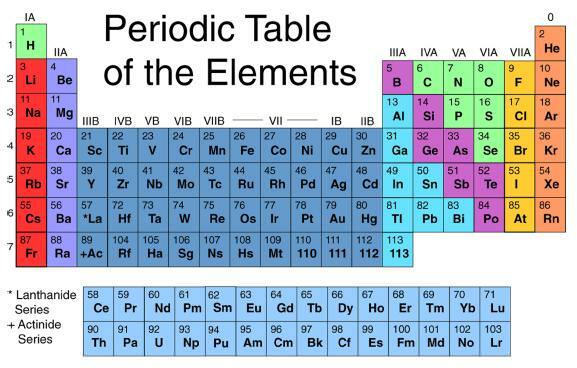 If I was plucked out of our cozy environment and dropped into the near vacuum of pretty much anywhere else, the only resource would be a handful of hydrogen atoms. And what can you do with a few hydrogen atoms? Nothing. It might even give Bear Grylls a run for his money. He might have a little more trouble on a star’s surface, crisping up in a heartbeat. Into a black hole? Surface of a neutron star? Near an exploding supernova? Please enjoy the crushing pressures and hellish temperatures of Venus, or the freezing irradiated surface of Mars. Earth itself is mostly a deathtrap. Travel down a few kilometers and you’d bake and crush from the rising temperatures of the Earth’s interior. Travel up and the air gets thin, cold and killy. In fact, without our technology heating, cooling, or helping us breathe, we wouldn’t last more than a few days on most of the planet. When you think about the landscape of time, we even live in a brief thumbnail of a moment when Earth is hospitable. Over the next few billion years, the Sun is going to heat up to the point that the surface of Earth will resemble the surface of Venus. And then the last hospitable hidey-hole in the entire Universe, that we know of, will wink out. The Universe is as inhospitable as it could possibly be. That is, without being completely inhospitable. Especially when you consider the timeframes, and the long future when all the stars have died, where there’s nothing but black holes and frozen matter, and the Universe finally ditches that rounding error, and becomes 100% purely inhospitable. Cosmologists use a term known as the anthropic principle to explain this very special moment we find ourselves in. There’s the greater anthropic principle that says the Universe wouldn’t be here without us to observe it, but that seems nutty and egotistical. The lesser anthropic principle says that if the Universe turned out any differently, we wouldn’t be here to observe it. Imagine you threw a dart out the window of an airplane and it landed in a tiny spot on the surface of the Earth. What were the chances that it would land there? Almost zero. What a lucky spot. So when you look out across a meadow in the springtime. The birds are chirping, and there’s new growth everywhere, don’t forget about the boiling rock magma beneath your feet, the frigid air and then vacuum above your head, and the whole Universe of burning, radiating, impacting objects trying their best to kill you. Of all the extreme environments in the Universe, which ones do you find most fascinating? Tell us in the comments below. In addition to being the birthplace of humanity and the cradle of human civilization, Earth is the only known planet in our Solar System that is capable of sustaining life. As a terrestrial planet, Earth is located within the Inner Solar System between between Venus and Mars (which are also terrestrial planets). This place Earth in a prime location with regards to our Sun’s Habitable Zone. 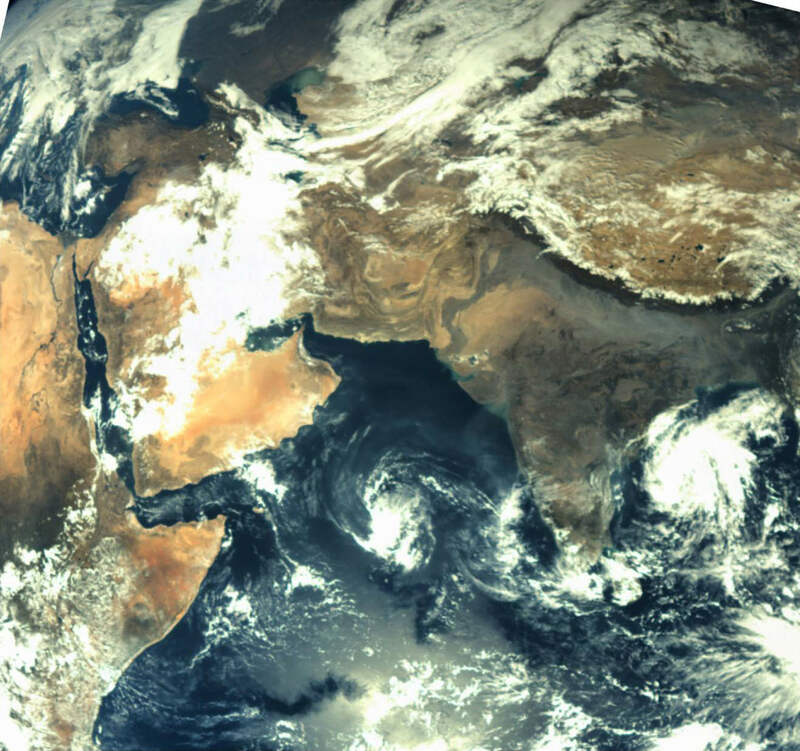 Earth has a number of nicknames, including the Blue Planet, Gaia, Terra, and “the world” – which reflects its centrality to the creation stories of every single human culture that has ever existed. But the most remarkable thing about our planet is its diversity. Not only are there an endless array of plants, animals, avians, insects and mammals, but they exist in every terrestrial environment. So how exactly did Earth come to be the fertile, life-giving place we all know and love? What is the Earth’s Average Temperature? Earth is the only planet in our Solar System where life is known to exists. Note the use of the word “known”, which is indicative of the fact that our knowledge of the Solar System is still in its infancy, and the search for life continues. However, from all observable indications, Earth is the only place in our Solar System where life can – and does – exist on the surface. This is due to a number of factors, which include Earth’s position relative to the Sun. Being in the “Goldilocks Zone” (aka. habitable zone), and the existence of an atmosphere (and magnetosphere), Earth is able to maintain a stable average temperature on its surface that allows for the existence of warm, flowing water on its surface, and conditions favorable to life. The average temperature on the surface of Earth depends on a number of factors. These include the time of day, the time of year, and where the temperatures measurements are being taken. Given that the Earth experiences a sidereal rotation of approximately 24 hours – which means one side is never always facing towards the Sun – temperatures rise in the day and drop in the evening, sometimes substantially. And given that Earth has an inclined axis (approximately 23° towards the Sun’s equator), the Northern and Southern Hemispheres of Earth are either tilted towards or away from the Sun during the summer and winter seasons, respectively. And given that equatorial regions of the Earth are closer to the Sun, and certain parts of the world experience more sunlight and less cloud cover, temperatures range widely across the planet. However, not every region on the planet experiences four seasons. At the equator, the temperature is on average higher and the region does not experience cold and hot seasons in the same way the Northern and Southern Hemispheres do. This is because the amount of sunlight the reaches the equator changes very little, although the temperatures do vary somewhat during the rainy season. The average surface temperature on Earth is approximately 14°C; but as already noted, this varies. For instance, the hottest temperature ever recorded on Earth was 70.7°C (159°F), which was taken in the Lut Desert of Iran. These measurements were part of a global temperature survey conducted by scientists at NASA’s Earth Observatory during the summers of 2003 to 2009. For five of the seven years surveyed (2004, 2005, 2006, 2007, and 2009) the Lut Desert was the hottest spot on Earth. However, it was not the hottest spot for every single year in the survey. In 2003, the satellites recorded a temperature of 69.3°C (156.7°F) – the second highest in the seven-year analysis – in the shrublands of Queensland, Australia. And in 2008, the Flaming Mountain got its due, with a yearly maximum temperature of 66.8°C (152.2°F) recorded in the nearby Turpan Basin in western China. Meanwhile, the coldest temperature ever recorded on Earth was measured at the Soviet Vostok Station on the Antarctic Plateau. Using ground-based measurements, the temperature reached a historic low of -89.2°C (-129°F) on July 21st, 1983. Analysis of satellite data indicated a probable temperature of around -93.2 °C (-135.8 °F; 180.0 K), also in Antarctica, on August 10th, 2010. However, this reading was not confirmed by ground measurements, and thus the previous record remains. All of these measurements were based on temperature readings that were performed in accordance with the World Meteorological Organization standard. By these regulations, air temperature is measured out of direct sunlight – because the materials in and around the thermometer can absorb radiation and affect the sensing of heat – and thermometers are to be situated 1.2 to 2 meters off the ground. Despite variations in temperature according to time of day, season, and location, Earth’s temperatures are remarkably stable compared to other planets in the Solar System. For instance, on Mercury, temperatures range from molten hot to extremely cold, due to its proximity to the Sun, lack of an atmosphere, and its slow rotation. In short, temperatures can reach up to 465 °C on the side facing the Sun, and drop to -184°C on the side facing away from it. Venus, thanks to its thick atmosphere of carbon dioxide and sulfur dioxide, is the hottest planet in our Solar System. At its hottest, it can reach temperatures of up to 460 °C on a regular basis. Meanwhile, Mars’ average surface temperature is -55 °C, but the Red Planet also experiences some variability, with temperatures ranging as high as 20 °C at the equator during midday, to as low as -153 °C at the poles. On average though, it is much colder than Earth, being just on the outer edge of the habitable zone, and because of its thin atmosphere – which is not sufficient to retain heat. In addition, its surface temperature can vary by as much as 20 °C due to Mars’ eccentric orbit around the Sun (meaning that it is closer to the Sun at certain points in its orbit than at others). Since Jupiter is a gas giant, and has no solid surface, an accurate assessment of it’s “surface temperature” is impossible. But measurements taken from the top of Jupiter’s clouds indicate a temperature of approximately -145°C. Similarly, Saturn is a rather cold gas giant planet, with an average temperature of -178 °Celsius. But because of Saturn’s tilt, the southern and northern hemispheres are heated differently, causing seasonal temperature variation. Uranus is the coldest planet in our Solar System, with a lowest recorded temperature of -224°C, while temperatures in Neptune’s upper atmosphere reach as low as -218°C. In short, the Solar System runs the gambit from extreme cold to extreme hot, with plenty of variance and only a few places that are temperate enough to sustain life. And of all of those, it is only planet Earth that seems to strike the careful balance required to sustain it perpetually. Estimates on the average surface temperature of Earth are somewhat limited due to the fact that temperatures have only been recorded for the past two hundred years. Thus, throughout history the recorded highs and lows have varied considerably. An extreme example of this would during the early history of the Solar System, some 3.75 billion years ago. At this time, the Sun roughly 25% fainter than it is today, and Earth’s atmosphere was still in the process of formation. Nevertheless, according to some research, it is believed that the Earth’s primordial atmosphere – due to its concentrations of methane and carbon dioxide – could have sustained surface temperatures above freezing. Earth has also undergone periodic climate shifts in the past 2.4 billion years, including five major ice ages – known as the Huronian, Cryogenian, Andean-Saharan, Karoo, and Pliocene-Quaternary, respectively. These consisted of glacial periods where the accumulation of snow and ice increased the surface albedo, more of the Sun’s energy was reflected into space, and the planet maintained a lower atmospheric and average surface temperature. These periods were separated by “inter-glacial periods”, where increases in greenhouse gases – such as those released by volcanic activity – increased the global temperature and produced a thaw. This process, which is also known as “global warming”, has become a source of controversy during the modern age, where human agency has become a dominant factor in climate change. Hence why some geologists use the term “Anthropocene” to refer to this period. Thanks to increasing concentrations of CO² and other greenhouses gases, which are generated by human activity, average surface temperatures have been steadily increasing since the mid-20th century. For the past few decades, NASA has been charting average surface temperature increases through the Earth Observatory. When talking about the temperatures of planets, there is a major difference between what is measured at the surface and what conditions exist within the planet’s interior. Essentially, the temperature gets cooler the farther one ventures from the core, which is due to the planet’s internal pressure steadily decreasing the father out one goes. And while scientists have never sent a probe to our planet’s core to obtain accurate measurements, various estimates have been made. For instance, it is believed that the temperature of the Earth’s inner core is as high as 7000 °C, whereas the outer core is thought to be between 4000 and 6000 °C. Meanwhile, the mantle, the region that lies just below the Earth’s outer crust, is estimated to be around 870 °C. And of course, the temperature continues to steadily cool as you rise in the atmosphere. In the end, temperatures vary considerably on every planet in our Solar System, due to a multitude of factors. But from what we can tell, Earth is alone in that it experiences temperature variations small enough to achieve a degree of stability. Basically, it is the only place we know of that it is both warm enough and cool enough to support life. Everywhere else is just too extreme! Universe Today has articles on the temperature of Earth and the temperature of the planets. Here are some interesting facts about planet Earth, and here’s an article about why Earth has seasons. For more information, try Earth’s temperature tracker and seasonal temperature cycles. With the discovery of water ice in so many locations in the Solar System, scientists are hopeful in the search for life on other worlds. Guest Morgan Rehnberg returns to Astronomy Cast to explain the best places we should be looking for life. On Tuesday, December 16, 2014, NASA scientists attending the American Geophysical Union Fall Meeting in San Francisco announced the detection of organic compounds on Mars. The announcement represents the discovery of the missing “ingredient” that is necessary for the existence – past or present – of life on Mars. Indeed, the extraordinary claim required extraordinary evidence – the famous assertion of Dr. Carl Sagan. The scientists, members of the Mars Science Lab – Curiosity Rover – mission, worked over a period of 20 months to sample and analyze Martian atmospheric and surface samples to arrive at their conclusions. The announcement stems from two separate detections of organics: 1) ten-fold spikes in atmospheric Methane levels, and 2) drill samples from a rock called Cumberland which included complex organic compounds. Methane, of the simplest organic compounds, was detected using the Sample Analysis at Mars instrument (SAM). This is one of two compact laboratory instruments embedded inside the compact car-sized rover, Curiosity. Very soon after landing on Mars, the scientists began to use SAM to periodically measure the chemical content of the Martian atmosphere. Over many samples, the level of Methane was very low, ~0.9 parts per billion. However, that suddenly changed and, as scientists stated in the press conference, it was a “wow” moment that took them aback. Brief daily spikes in Methane levels averaging 7 parts per billion were detected. The detection of methane at Mars has been claimed for decades, but more recently, in 2003 and 2004, independent research teams using sensitive spectrometers on Earth detected methane in the atmosphere of Mars. One group led by Vladimir Krasnopolsky of Catholic University, and another led by Dr. Michael Mumma from NASA Goddard Space Flight Center, detected broad regional and temporal levels of Methane as high as 30 parts per billion. Those announcements met with considerable skepticism from the scientific community. And the first atmospheric measurements by Curiosity were negative. However, neither group backed down from their claims. The sudden detection of ten-fold spikes in methane levels in Gale crater is not inconsistent with the earlier remote measurements from Earth. The high seasonal concentrations were in regions that do not include Gale Crater, and it remains possible that the Curiosity measurements are of a similar nature but due to some less active process than exists at the regions identified by Dr. Mumma’s team. The NASA scientists at AGU led by MSL project scientist Dr. John Grotzinger emphasized that they do not yet know how the methane is being generated. The process could be biological or not. There are abiotic chemical processes that could produce methane. However, the MSL SAM detections were daily spikes and represent an active real on-going process on the red planet. This alone is a very exciting aspect of the detection. The team presented slides to describe how methane could be generated. With the known low background levels of methane at ~ 1 part per billion, an external cosmic source, for example micro-meteoroids entering the atmosphere and releasing organics which is then reduced by sunlight to methane, could be ruled out. The methane source must be of local origin. The scientists illustrated two means of production. In both instances, there is some daily – or at least periodic – activity that is releasing methane from the subsurface of Mars. The source could be biological which is accumulated in subsurface rocks then suddenly released. Or an abiotic chemistry, such as a reaction between the mineral olivine and water, could be the generator. The subsurface storage mechanism of methane proposed and illustrated is called clathrate storage. Clathrate storage involves lattice compounds that can trap molecules such as methane which can subsequently be released by physical changes in the clathrate, such as solar heating or mechanical stresses. Through press Q&A, the NASA scientists stated that such clathrates could be preserved for millions and billions of years underground. The second discovery of organics involved more complex compounds in surface materials. Also since arriving at Mars, Curiosity has utilized a drilling tool to probe the interiors of rocks. Grotzinger emphasized how material immediately at the surface of Mars has experienced the effects of radiation and the ubiquitous soil compound perchlorate reducing and destroying organics both now and over millions of years. The detection of no organics in loose and exposed surface material had not diminished NASA scientists’ hopes of detecting organics in the rocks of Mars. Drilling was performed on several selected rocks and it was finally a mud rock called Cumberland that revealed the presence of organic compounds more complex than simple methane. The scientists did emphasize that what exactly these organic compounds are remains a mystery because of the confounding presence of the active chemical perchlorate which can quickly breakdown organics to simpler forms. The detection of organics in the mud rock Cumberland required the drilling tool and also the scoop on the multifaceted robotic arm to deliver the sample into the SAM laboratory for analysis. To detect methane, SAM has an intake valve to receive atmospheric samples. Dr. Grotzinger described how Cumberland was chosen as a sample source. The rock is called a mud stone which has undergone a process called digenesis – the metamorphosis of sediment to rock. Grotzinger emphasized that fluids will move through such rock during digenesis and perchlorate can destroy organics in the process. Such might be the case for many metamorphic rocks on the Martian surface. The panel of scientists showed a comparison between rock samples measured by SAM. Two in particular – from the rock “John Klein” and the Cumberland rock — were compared. The former showed no organics as well as other rocks that were sampled; but Cumberland’s drill sample from its interior did reveal organics. The analysis of the work was painstaking – harking back to the Sagan statement. The importance of discovering organics on Mars could not be understated by the panel of scientists and Grotzinger called these two discoveries as the lasting legacy of the Mars Curiosity Rover. Furthermore, he stated that the discovery and analysis methods will go far to guide the choice of instruments and their use during the Mars 2020 rover mission. The discovery of organics completes the necessary set of “ingredients” for past or present life on Mars: 1) an energy source, 2) water, and 3) organics. These are the basic requirements for the existence of life as we know it. The search for life on Mars is still just beginning and the new discoveries of organics is still not a clear sign that life existed or is present today. Nevertheless, Dr. Jim Green, introducing the panel of scientists, and Dr. Grotzinger both emphasized the magnitude of these discoveries and how they are tied into the objectives of the NASA Mars program — particularly now with the emphasis on sending humans to Mars. For the Mars Curiosity rover, the journey up the slopes of Mount Sharp continues and now with greater earnestness and a continued search for rocks similar to Cumberland. Detection of methane in the martian atmosphere: evidence for life? When large asteroids or comets strike the Earth — as they have countless times throughout our planet’s history — the energy released in the event creates an enormous amount of heat, enough to briefly melt rock and soil at the impact site. That molten material quickly cools, trapping organic material and bits of plants and preserving them inside fragments of glass for tens of thousands, even millions of years. 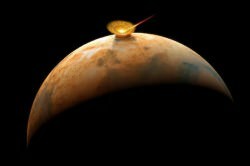 Researchers studying impact debris on Earth think that the same thing could very well have happened on Mars, and that any evidence for ancient life on the Red Planet might be found by looking inside the glass. A research team led by Pete Schultz, a geologist at Brown University in Providence, Rhode Island, has identified the remains of plant materials trapped inside impact glass found at several different sites scattered across Argentina, according to a university news release issued Friday, April 18. Melt breccias from two impact events in particular, dating back 3 and 9 million years, were discovered to contain very well-preserved fragments of vegetation — providing not only samples of ancient organisms but also snapshots of the local environment from the time of the events. 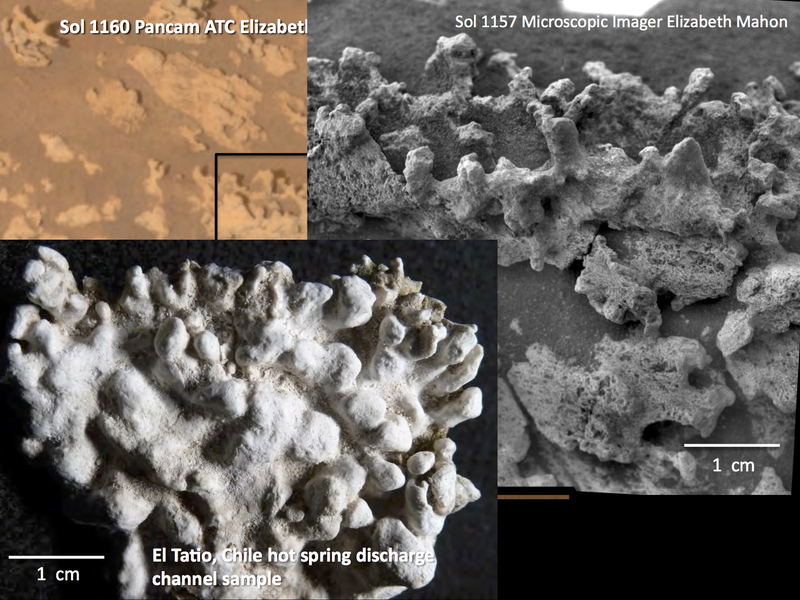 Schultz believes that the same process that trapped once-living material in Argentina’s Pampas region — which is covered with windblown, Mars-like sediment, especially in the west — may have occurred on Mars, preserving any early organics located at and around impact sites. The research has been published in the latest issue of Geology Magazine.